- Holds hair back off your face comfortably and securely. 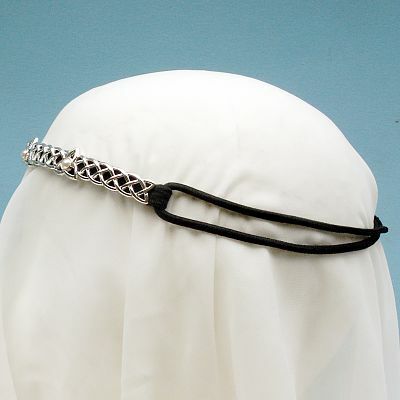 The knotwork panels in this headband are set onto an elastic base, ensuring that it will conform to the shape and size of your head, with no pinching or prodding. Each triquetra is set with a lustrous faux pearl at its center. Perfect for weddings and handfastings. One size fits most. Do you have any other questions about our Triquetra Headband? Finally, a beautiful headband that doesn't pierce my skull! This headband is just beautiful. The light hits it just right :) And it is COMFY! I wish it came in more colors/designs--I'd gladly buy more.